Based on the reviews online, it looks like Schuberth paid attention to customer feedback when designing the upgraded version of the C3 flip-up helmet, the C3 Pro—now available at Bob’s. The C3 Pro features a new spoiler helping to improve its aerodynamics, a new inner liner offering a better fit, and thanks to Schuberth’s wind tunnel tested design the C3 Pro is quieter than ever! Sarah Schilke from Schuberth North America visited Bob’s in February to personally introduce and explain the upgrades to the helmet. The changes are subtle but once you test both helmets, no one can argue the newer version is superior. It is lighter, quieter, its visor and flip front is easier to use, and it is an overall better fit. Bob’s offers test rides with the C3 helmet and now with the C3 Pro in stock, we encourage you to come in and see the differences for yourself. The better fitting inner liner is completely removable and washable. The new spoiler was designed and tested to prevent lift at speeds over 100 mph. At 60mph, the helmet is only at 82 decibels making it the world’s quietest helmet. It comes with a built in FM radio with better reception and range than its predecessor, allowing the SRC system to communicate with other systems up to half-a-mile away. And unlike other helmets that advertise anti-fog, the anti-fog feature in the C3 Pro really works offering better visibility for riders on colder days. Finally, as the inventor of the flip-up helmet, the new sun swivel visor feature offers great sun protection plus makes it convenient for riders wearing glasses. The C3 Pro is available for men and women in gloss and matte black, white, silver, and Hi-Vis. 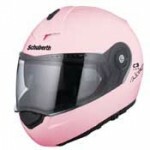 As with the C3, Schuberth offers a women’s version of the C3 Pro, designed specifically with a woman’s facial structure in mind, plus the C3 Pro Women helmet will be available in pearl pink!